Meizu HoleLess Phone Image Released Ahead of Launch - Playfuldroid! 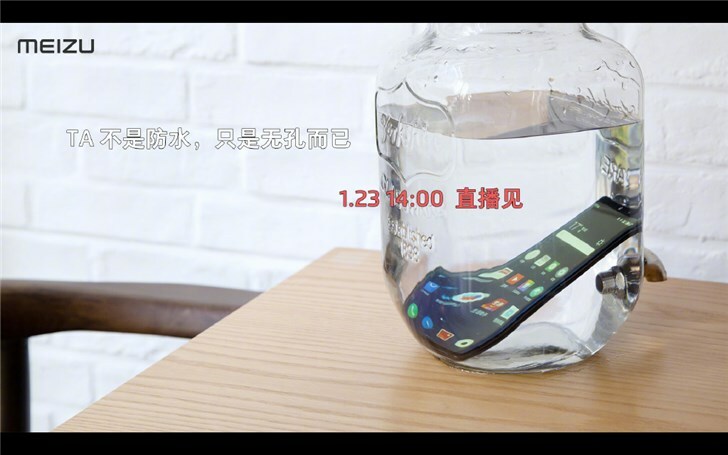 Meizu has confirmed that it will be doing a live broadcasting at 2 PM (local time) to showcase the smartphone. The handset placed inside the jar of water does not feature any buttons on its right edge and its side and bottom bezels appear quite thin. However, the upper bezel of the phone is a bit. So, what could have Meizu might have done to make the phone completely hole-less. For earpiece and speaker, the phone could be equipped with screen soundcast technology. It could be featuring a glass rear that may allow it to support fast charging. For audio, users may make use of Bluetooth enabled earbuds. It remains to be seen what alternate technology Meizu might have in store for microphone and SIM card slot on the device.